The Cooking Actress: Buckeye Cake + Happy 1st Birthday to The Cooking Actress! Since my lil' blog is 1 year old today, I figured it (and you!) deserved a birthday cake!! Ok, technically, this is a Buckeye cake, but it's a cake! It is especially fitting that this is a Buckeye cake. First-peanut butter and chocolate, classic Cooking Actress. Second-Buckeyes! I'm from Ohio! It's an Ohio thing...somehow we became attached to these silly inedible nuts: but the delicious candies that were created to resemble them totally make Buckeyes move up on my list :). And...obviously...while decorating...I sort of just...went crazy. Those decorations are a perfect example of Kayle. Can I tell you how delicious this cake is? 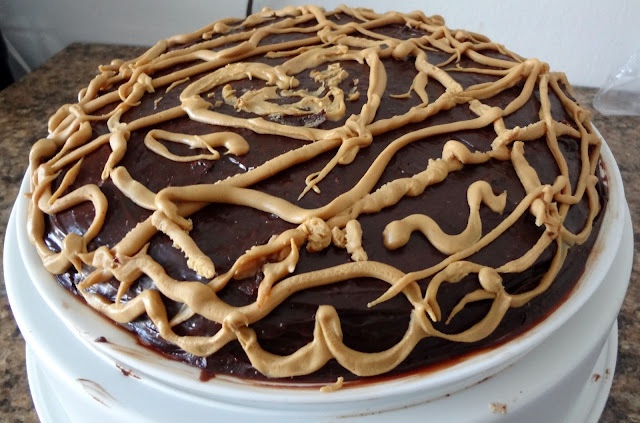 The cake is dense and rich, the peanut butter is perfectly...peanut buttery, and the ganache layer is just RIDICULOUS-completely sending this cake over the top! Michael and I were gaga about it, and it definitely disappeared way too quickly. Grease a 9 in. round cake pan. Line the bottom with parchment paper-grease. Cake- Combine eggs and sugar in a large bowl. Stir in flour, melted butter and chocolate, vanilla extract, and salt until smooth. Pour batter into prepared pan. Bake for 25 minutes (until a toothpick inserted in the middle of the cake comes out clean). Cool on a wire wrack for 5 minutes. Run a knife around the edge of the cake. Cool at least 10 more minutes and invert the cake onto a serving platter. Remove the pan and parchment. Cool completely. Peanut Butter- Beat peanut butter, butter, and vanilla until well combined. Gradually beat in the powdered sugar. 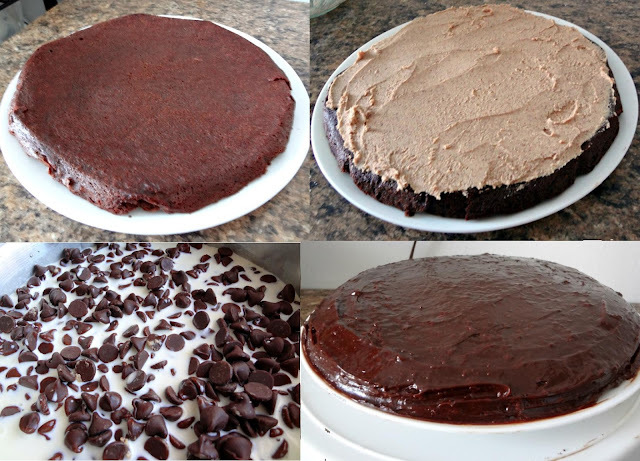 Spread mixture on cooled cake. Refrigerate for 30 minutes. Ganache- Heat cream in a small saucepan to boiling. Remove from heat. Add chocolate chips and let stand for 5 minutes. Stir until smooth. Refrigerate 30 minutes-until the ganache is spreadable. Spread on top and sides of the cake. Garnish- Microwave peanut butter chips in a Ziploc bag on 70% power for 30 seconds. Knead bag. Continue to microwave for 10-15 second intervals until melted. Cut a small hole in corner of the bag. Squeeze to drizzle over cake (a criss-cross pattern might be a...more conventional alternative to my artistic expression). Store cake in refrigerator. Let stand 30 minutes before serving. Happy 1 year blogoversary! It is a great day to take time and reflect how far you have come in one short year. The time does fly when you are blogging! Your cake does look like the perfect way to celebrate. 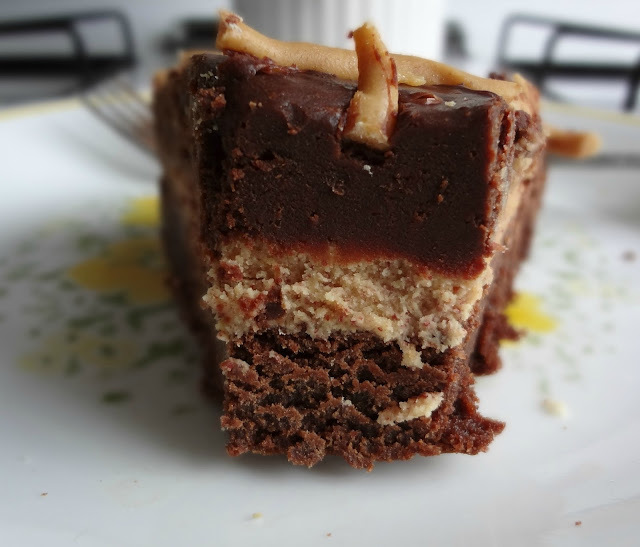 That close up of the layers does have me sold-yum! Enjoy the weekend. "happy birthday to you, happy birthday to you..." i have to admit, the peanut butter/chocolate combo is an acquired taste for me, but this looks DIVINE. Happy birthday to you! Happy birthday to you! Happy birthday dear Cooking Actressssssss! Happy birthday to youuuuuuuuuu! And many mooooooooooore! Happy blogiversary! May you be blessed with many more! Happy blogiversary! 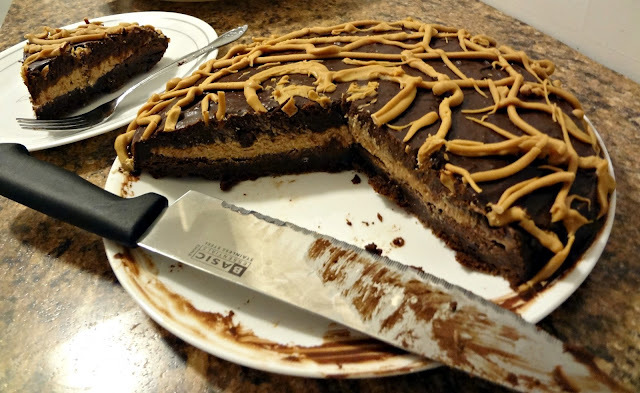 I just stopped by to tell you that that cake looks all fudgy and chocolatey and peanut buttery and delicious...y. Here's to many more cakes and birthdays! This looks so darn yummy!! !Happy Blogiversary!! YAY! In the words of my grandfather, "Happy bird eggs to The Cooking Actress!" So exciting Kayle! Congratulations! Happy 1 year anniversary to you! Congratulations for doing it! p.s. cake looks delicious. 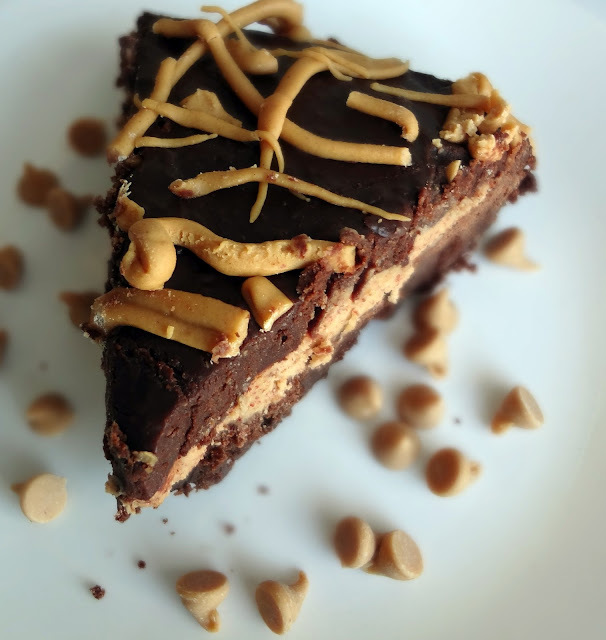 I love my peanut butter and chocolate combinations! Happy Blogiversary to you too and the cake looks fantastic! I love your birthday cake! Happy Blogiversary to you, my dear Kayle! I'm sure its been a fabulous year for you! Congrats on being up for 1 year!! I love buckeyes, and this cake looks incredible! I was introduced to them when I met my husband. He's from Ohio...and I think it's a rite of passage or something. So glad I was introduced. They're soo good! Can't wait to try this cake! It's true----this cake is even BETTER than Buckeyes! Happy first Birthday! 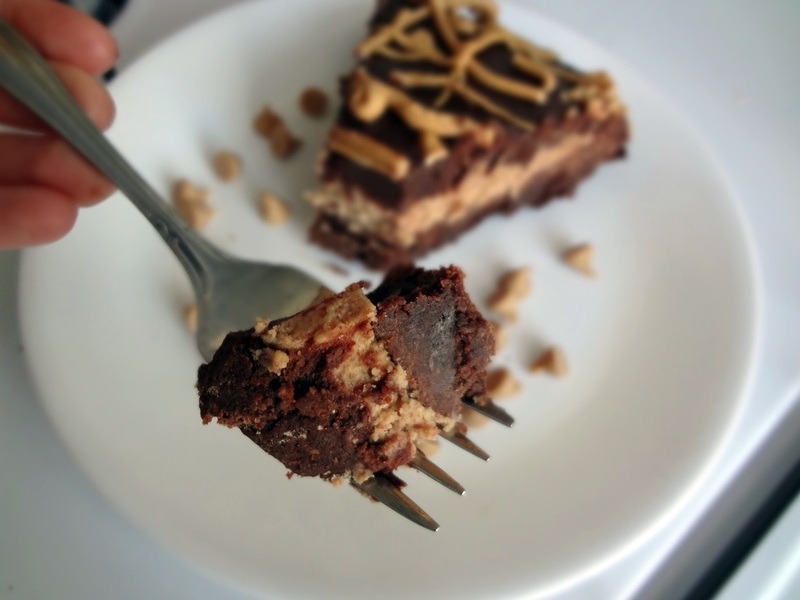 First time to your blog and love the peanut butter chocolate combination! This cake looks delish! Happy Blogversary! I am new to your blog and I'm off to take a peek around! Have a fantastic weekend! You have had a stunning year with many more to come! I loved this cake! First time here and loved your space. You have an interesting array of recipes! Yay! Happy Blogoversary! I can't believe I missed you, sorry for the belated wishes! Cake looks UNREAL. YUM. 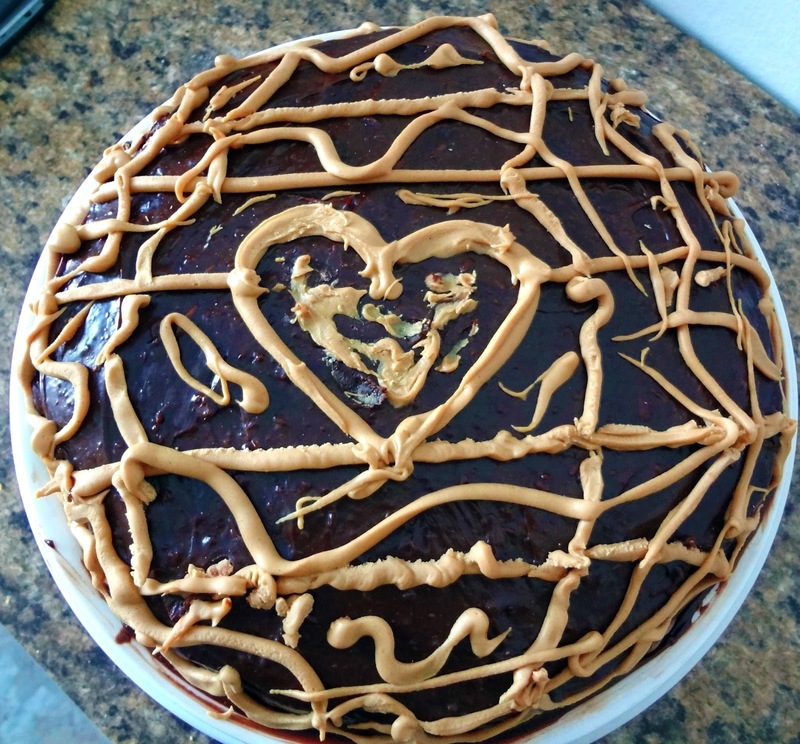 That is like everything I love baked into one, peanut butter chocolate cake is dangerous stuff, it soooo yummy! I have had buckeyes before but never a cake. It looks and sounds delicious. Happy 1st year and here is to many more to come! Happy one year and congrats on all the success! That's wonderful and your buckeye cake is a great way to celebrate! Happy anniversary to your wonderful blog!!! What a fantastic cake to help you celebrate....mmmmmmmm.